There are many street tea/coffee sellers around India, and although the water has been boiled at some point, often the pots are out for a long time. The clay cups are also lying around in the dust. Is it safe to drink? If you define safe as 'not contracting a water-borne disease', then yes, you will be safe from contracting typhoid, jaundice, etc when you drink tea/coffee from street-side vendors. Boiling during the preparation effectively kills of the disease-causing germs, even if kept in covered kettles/pots as they usually are. A dirty clay cup would not cause a disease either as that's not the route for transmission of most of those diseases. Some street-vendors will prepare a cup fresh-to-order if you ask them to, but getting yourself understood is a different story altogether. With tea/coffee, it is usually unlikely that you'll get stomach cramps even for tourists. Other things such as dodgy ice are far more likely to get you sick. Cold drinks and foods are usually more dangerous: as others have pointed out, you should be careful about fresh fruits or vegetables that you haven't prepared, and always either decline ice in your drink or specifically ask if it was made from filtered water (you might need to use the term "R/O water" - filtered through reverse osmosis). 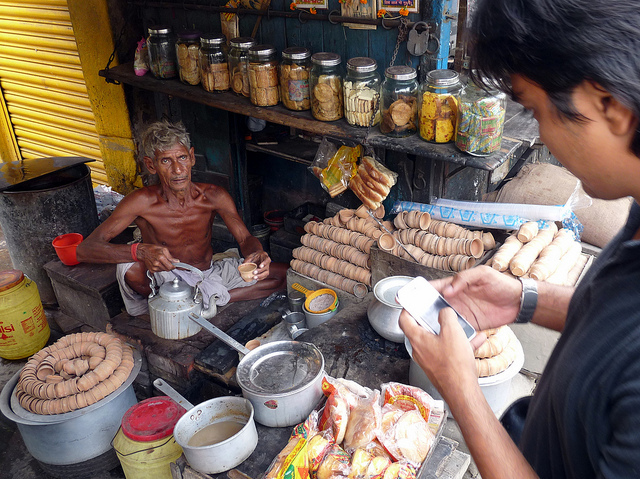 Ice cream / kulfi that isn't pre-packaged can be dangerous, too; street vendors typically don't wash their hands often. The bottom line is to be cautious without detracting from your sense of adventure and experiencing everything India has to offer. Ask if you have questions about the way something is prepared, be observant about the conditions of your food and its preparation, and when in doubt, go with your gut (no pun intended). In general, you have to be careful. Like @hippietrail already mentions in the comments, the more popular the place is, the more safe it will be. But... it's not always because it's safe for the locals that it will be safe for you! Especially if you're only traveling there for a couple of weeks, and you're not used to foreign food, I'd advice you not to drink any tap water that's not boiled for 10 minutes by yourself (or eat fresh food that's not peeled by yourself for that matter). Although, when you're traveling for a longer time (longer than a month), you can get your stomach accustomed to it, so when you start slowly, after a while you can even drink unboiled tap water in most places. Disclaimer: I haven't been to India yet, but I've been to Africa and South America, and I think this general advice applies for all places where the tap water isn't considered safe to drink by western standards. preparation in unclean situation by people with unwashed hands. very unclean utensils they serve it in. Many people living and travelling to India can suggest to you that nothing wrong will happen on consuming it, but I say it's better to be safe then worry, having food at good places can be costly, but it will save you from many other expenses. right @hippieTrail: I work in other city then my hometown (Mumbai, famous for it's streetside food), and prefer either food cooked on my own, or cooked by my maid in my home. and believe me first thing i taught to my maid was to daily wash her hands before starting cooking :-). by the way above advice was just based on comparative basis, if you need complete protection about your health, make arrangement for a place with your own kitchens, that is the best deal you can get here. It is not generally appreciated that just bringing water to about 90 degrees C will kill almost all pathogens instantly (as stated in the short but excellent Water treatmemnt page referred to by vistet.) The exception are nasties which form physically large cysts, such as Giardia. THese can be dealt with with quite simple filtration - but that's probably not useful for premade tea. and for most cases, 'after a short while' at 70 C.
The exceptions in the last case MAY be large sized objects which form a cyst such as Giardia. While the major route of transmission will be via contaminated water if it has not been purified, secondary recontamination from cups, hands and airborne material is a very well known means of introducing disease into previously sterilised liquids. I have carried out extensive investigation into methods for provision of safe drinking water and it is invariably necessary to take active steps to avoid post sterilisation contamination and/or to ensurte there is resdiual sterilisation component available in the liquid. Residual sterilisation effect may be applicable with chlorinated water or when usimg eg filter pots using colloidal silver which leach small amounts of si;lver into the output water, but is very unlike;y to apply to drinks from street vendors. One possible solution is to wipe or rinse the inside of the cup with a sterilising solution. This is liable to at a minimum detract from the authenticity of the occasion and will likely attract some attention and make you look like a crazy westerner. or a suitably dilute benzalkonium chloride (BAQ) solution. Alcohol that has been treated with a bittering agent will wreck a large amount of drink with a small amount of 'flavor'. Chlorine solution needs to be strong enough to be fast acting and weak enough to not be excessively 'tasty'. BAQ can be reasonably dilte. Some reading is in order, but probably 0.01% - 0.1% range may be OK. Stronger is liable to start tasting a little. Too weak and effectiveness rate will drop. Some systems use this at more like 0.001% - 0.01% range if exposure is long enough. In my opinion the first time you eat the street food & drink you can get sick but after that you get used to it. The second thing to be aware of is that if you does not want to use street food & drink, you can use other costly places where all the food & drink is made cleanly & tidy. It depends on you, otherwise street food is good in taste. I live in India and it has not affected me once. Tea & coffee is boiled, thus safe. This is true at any altitude tea is served . I have lived by this many months in Leh, same altitude as Lhasa, and on the road there with tea stalls a thousand meters higher. Water is safe by mouth long before it reaches 100 degrees, given time. See here for more on this, with sources. Hygienic Place to start with ( Now a days there are lots of them). Food is cooked ( Do not eat in hurry. You need your stomach in good condition in India). If you are trying spicy food in India, take it only in known places. Not the answer you're looking for? Browse other questions tagged india safety food-and-drink or ask your own question. Is it safe to drink bubble tea in Hong Kong? Is it safe to drink the tap water in Istanbul? How safe is northeast India?